We provide premium quality genuine free range hunts for Tahr, Red Stag and Chamois. Private Land - No Fences - Wild populations. ​Based at Lake Coleridge in the iconic Rakaia Valley in the centre of New Zealand's South Island high country, our base is located only 1 hour, 15 minutes drive from Christchurch International Airport, we are located in the heart of New Zealand's prime mountain hunting country. We are passionate about hunting - we understand that the experience - the hunt - is just as important as a quality trophy. 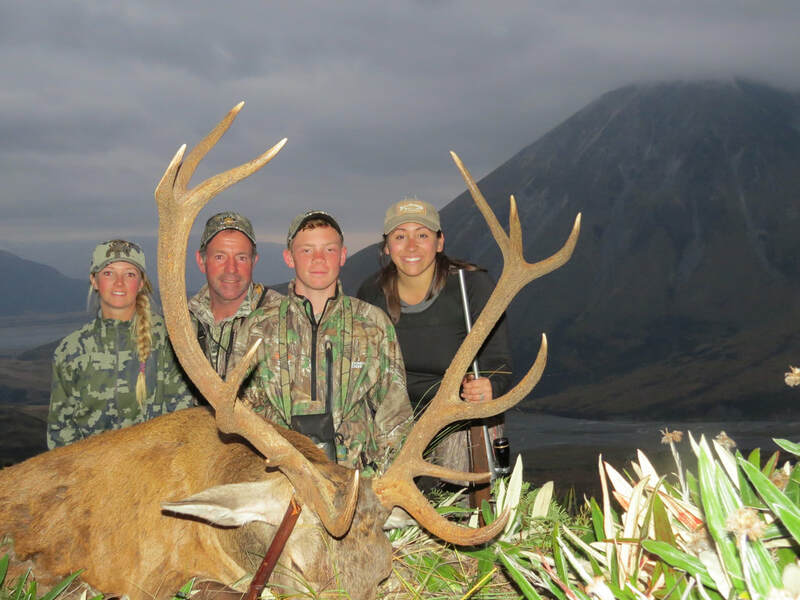 We specialise in high quality - genuine free range hunts in some of New Zealand's most spectacular country. Our hallmarks are Professionalism - Safety - Adventure and Satisfaction. James is President of the New Zealand Professional Hunting Guides Association, he also developed and runs the NZPHGA - 'Professional Hunter Academy' - running and instructing the NZPHGA Hunting Guide Training Courses annually during the off-season. With over 40 years hunting experience including extensive hunting and guiding experience in New Zealand, North America and Africa and a lifetime of outdoor experience, we have the credentials and experience to ensure that you are 'in good hands'. Go to 'About Us' to learn more about us and our operation. ​"If you want to do a trip of a lifetime in the magnificent New Zealand Alps, James Cagney is your guy!! James is a world-class hunting guide and will get you that trophy you always have dreamed about in an adventure you could not even dream about. You will go as a 'client' and leave (to return again) as a friend"
Our Guarantee - No High Fences - We hunt only genuine wild populations. Our base at Lake Coleridge is in the famous Rakaia Valley - home of New Zealand's most renowned wild trophy Red Stag herd and in the heart of New Zealand's Tahr and Chamois country. We hunt on several large private wilderness properties. While we hold a government concession to hunt vast areas of public wilderness land and conduct some of our hunts in these areas, most of our hunting is on private land. In contrast to New Zealand's unregulated and often over hunted public hunting environment, our private land hunting partnerships allow us total control of how many and which type of animals are harvested annually, allowing us optimum management of herd densities and trophy quality. All in all this provides a far superior free range hunting experience than can be achieved on public land. ​Our hunts are true 'Hunter's hunts' - genuine free range wilderness hunts. Our emphasis is on Quality - Experience and Adventure. We can tailor our hunts to your fitness level and physical ability. If you're looking for not only a quality trophy - but a genuine free range - wilderness hunting adventure in New Zealand's spectacular South Island mountain country - go to 'Hunting' to view our full Hunting page, including our hunt packages. Go to 'Gallery' to view images from our hunts - game animals - hunting & country - people - lodge - camps - trophies. ​​​​"My wife Julie and I knew that we wanted to go to New Zealand and hunt for Red Stag while celebrating our honeymoon. After doing a lot of research, many inquiries with outfitters, we happily chose James Cagney's New Zealand Hunting Adventures. Coming from Alaska we wanted to experience the type of hunting we are accustomed to at home in Alaska. The hunt itself met and far exceeded our expectations. James and his family were fantastic hosts and guides. They made us feel right at home with them. We both were able to take amazing Stags, experience the beautiful and challenging terrain of New Zealand and form close friendships with the Cagney's. Julie and I both worked hard for our trophies, James and his crew worked even harder in order to make it happen. Julie and I wholeheartedly recommend James' guide service. You will not be disappointed." "I was looking for a free range hunt in New Zealand, several people pointed me to James Cagney. It was the best trip of my life! 4 days, 2 bull tahr, 1 nice red stag, mountain air and adrenaline. If I was planning a trip again it would be New Zealand and it would be with James Cagney"
Copyright © James Cagney's New Zealand Hunting Adventures 2015.